If the average Kiwi were asked if he knew Rewi Alley, chances are that he would say ‘no’. But Rewi Alley was significant in changing an era of Chinese history and he is honoured and revered in China. Unfortunately that is not the case in New Zealand. 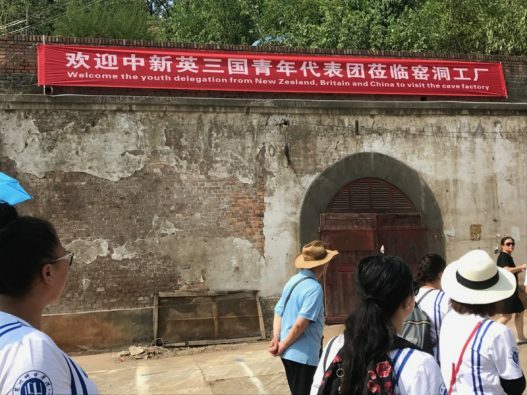 This prompted Dave Bromwich, president of the NZCFS,in 2017, as part of the commemorations of the anniversaries of Rewi Alley’s birth (120th), arrival in China (90th) and his death (30th) to send a group of 7 students to China to study his life and works. This was to include visiting places of historical significance in Rewi Alley’s story and also seeing at first-hand the legacy he left to a grateful Chinese nation. The tour took place in July, when University holidays in the two countries coincide. It was co-ordinated with a similar tour ‘In the Footsteps of George Hogg’, organised in the UK. Six delegates went on that tour. Getting an insight into Bailie Education and the co-operative movement both these men worked so hard for, was the primary objective with visits to Gung Ho co-operatives (some of which have been supported by NZCFS projects). 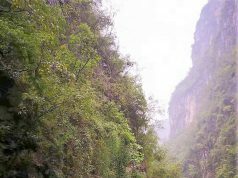 Visits to well-known historic sites such as the celebrated Terracotta Army at Xi’an and and the Great Wall were also included. 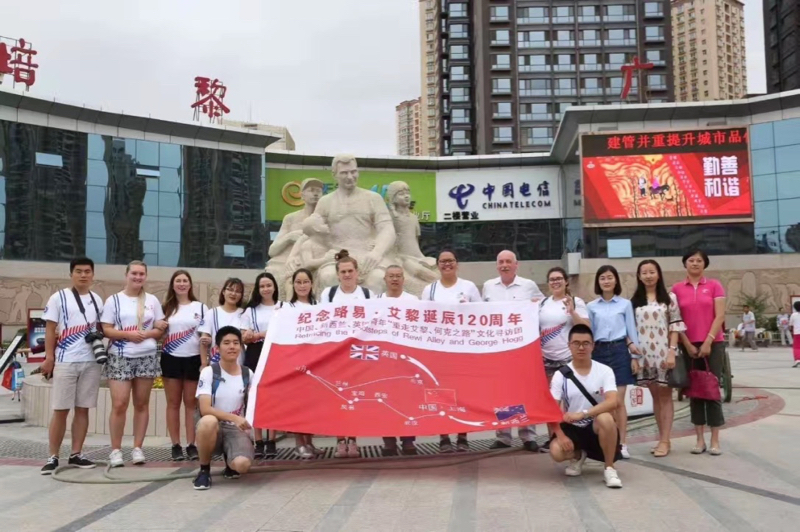 The tour delegates were escorted by Chinese students from Beijing Bailie University, Lanchou City University and Shandan Bailie School, who were specially selected for their interest in Rewi Alley (and George Hogg) and for their competence in English. 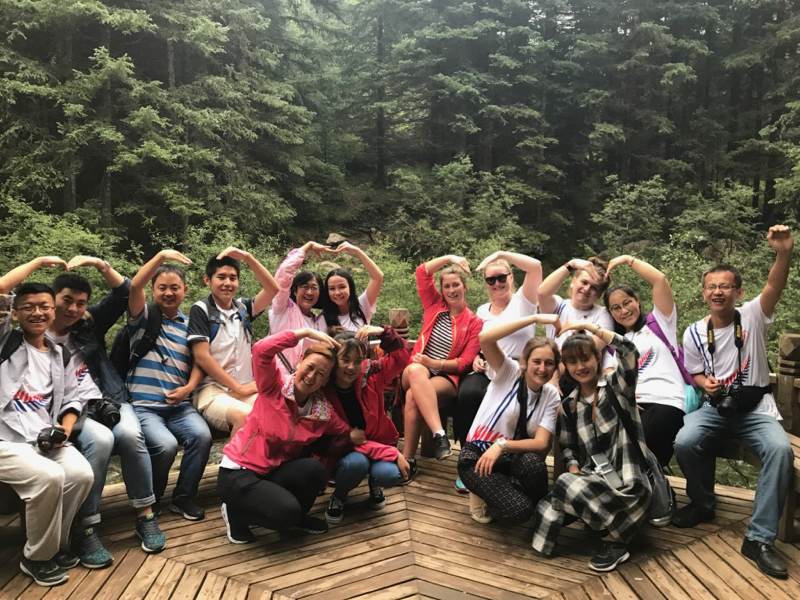 The Chinese escorts provided insights into China as the group travelled and visited sites. Lanzhou City University particularly emphasises making a positive contribution to society, and their Rewi Alley Research Centre is keen to promote the spirit of Rewi as a model to the young, incorporating these concepts in some of their study programmes. 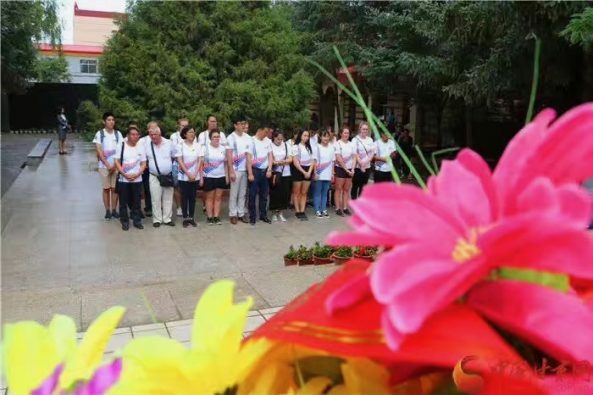 The students also visited ‘Rewi Alley’ sites in Beijing, Shanghai, Baoji – Shuangshipu (Shaanxi province), Honghu, Lanzhou and Shandan over a 12-day period. 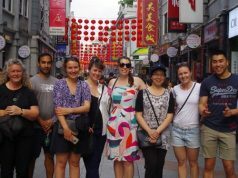 The students were selected through a promotion exercise that required them to state why they wished to participate and to present some understanding of the role that Rewi Alley continues to play in modern Chinese society. 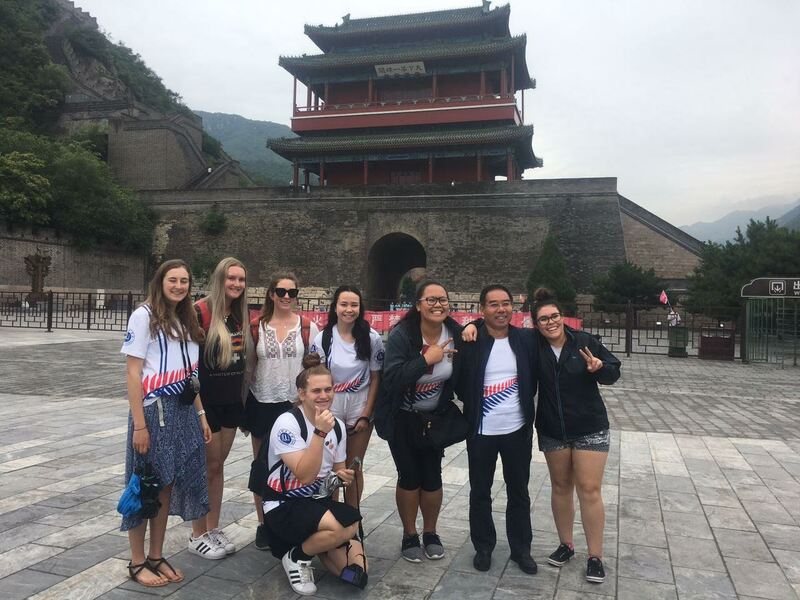 Lanzhou City University covered the cost of travel, accommodation and food in China while the Simon Deng Li Fund provided much of the funding for international travel for the trip. The students were required to provide a summary after the visit of their reactions and what new knowledge they had acquired from the tour. All expressed surprise and admiration at the wealth of work that Rewi and his friend George Hogg had achieved during their lifetimes for the good of the Chinese people, often during hard and dangerous times and of that country’s continued expression of thanks to their hero. This showed in the many sites dedicated to his memory and the continued expressions of thanks from the people that they met on the trip. The construction of the cave factory in Baoji was mentioned several times in the students’ reports as a typical example of how Rewi and his aides developed Gung Ho co-operatives that, besides making a considerable contribution to the war effort against Japan, provided accommodation and work for the very poor and many refugees at the height of the war. Each student wrote that their lives had been changed by the knowledge that one of their own NZ citizens had provided so much for the underprivileged at a time of great hardship and wrote that they were proud of his legacy and would certainly widen the knowledge of this great Kiwi hero when they returned home. Kate Gower-James wrote that she went into the trip with limited knowledge of Rewi Alley and George Hogg but felt like an expert when she left! Many also expressed a sincere wish to return and at least one is keen to take up Lanzhou City University’s offer of a Rewi Alley scholarship next year. GOWER-JAMES, Kate Leigh, university student, from Whanganui, North Island, NZ. For text of Kate Gower-James’ speech at CPAFFC (Youxie)‘s offices, Beijing, click HERE. 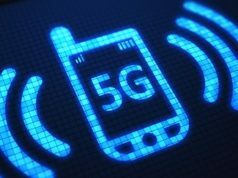 Click on the link on each name for their report or comment. Lanzhou City University companions who included Zhang Leitao, international liaison officer, Ms Shi Hong, director of Rewi Alley Research institute, Liu Guozhong, researcher at Rewi Alley Research Institute and Ms Liu Yanjun (Leanne). Note: Liu Guozhong is an honorary NZCFS member. Students from Beijing Bailie University.